This article is about human climbing. For climbing in other animals, see Arboreal locomotion. For other uses, see Climbing (disambiguation). Climbing is the activity of using one's hands, feet, or any other part of the body to ascend a steep object. It is done for locomotion, recreation and competition, in trades that rely on it, and in emergency rescue and military operations. It is done indoors and out, on natural and man-made structures. Guides, such as professional mountain guides, have historically been an essential element of pursuing the sport in the natural environment, and remain so today. Buildering: Ascending the exterior skeletons of buildings, typically without protective equipment. Canyoneering: Climbing along canyons for sport or recreation. Chalk climbing: Ascending chalk cliffs uses some of the same techniques as ice climbing. Competition climbing: A formal, competitive sport of recent origins, normally practiced on artificial walls that resemble natural formations. The International Federation of Sport Climbing (IFSC) is the official organization governing competition rock climbing worldwide and is recognized by the IOC and GAISF and is a member of the International World Games Association (IWGA). The UIAA is the official organization governing competition ice climbing worldwide. Competition climbing has three major disciplines: Lead, Bouldering and Speed. Free Climbing: a form of rock climbing in which the climber uses climbing equipment such as ropes and other means of climbing protection, but only to protect against injury during falls and not to assist progress. Ice climbing: Ascending ice or hard snow formations using special equipment, usually ice axes and crampons. 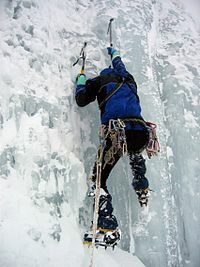 Techniques of protecting the climber are similar to those of rock climbing, with protective devices (such as ice screws and snow wedges) adapted to frozen conditions. Indoor climbing: Top roping, lead climbing, and bouldering artificial walls with bolted holds in a climbing gym. Ladder climbing: Climbing ladders for exercise. This may involve climbing up and down the underside of a ladder, or along a horizontally aligned ladder or 'monkey bars'. The ladder may be climbed going forwards, backwards, or sideways. Lumberjack tree-trimming and competitive tree-trunk or pole climbing for speed using spikes and belts. Mallakhamba: A traditional Indian sport which combines climbing a pole or rope with the performance of aerial Yoga and gymnastics. Mountaineering: Ascending mountains for sport or recreation. It often involves rock and/or ice climbing (Alpine climbing). 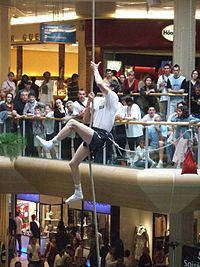 Pole climbing: Climbing poles and masts without equipment. Rock climbing: Ascending rock formations, often using climbing shoes and a chalk bag. Equipment such as ropes, bolts, nuts, hexes and camming devices are normally employed, either as a safeguard or for artificial aid. Rope access: Industrial climbing, usually abseiling, as an alternative to scaffolding for short works on exposed structures. Rope climbing: Climbing a short, thick rope for speed. Not to be confused with roped climbing, as in rock or ice climbing. Scrambling which includes easy rock climbing, and is considered part of hillwalking. 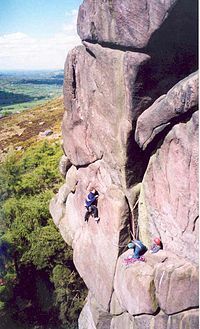 Sport climbing is a form of rock climbing that relies on permanent anchors fixed to the rock, and possibly bolts, for protection, (in contrast with traditional climbing, where the rock is typically devoid of fixed anchors and bolts, and where climbers must place removable protection as they climb). Traditional climbing (more casually known as Trad climbing) is a form of climbing without fixed anchors and bolts. Climbers place removable protection such as camming devices, nuts, and other passive and active protection that holds the rope to the rock (via the use of carabiners and webbing/slings) in the event of a fall and/or when weighted by a climber. Solo climbing: Solo climbing or soloing is a style of climbing in which the climber climbs alone, without somebody belaying them. When free soloing, an error usually is fatal as no belay systems are being used. Soloing can also be self-belayed, hence minimizing the risks. Tree climbing: Recreationally ascending trees using ropes and other protective equipment. A tower climber is a professional who climbs broadcasting or telecommunication towers or masts for maintenance or repair. Rock, ice and tree climbing all usually utilize ropes for safety or aid. Pole climbing and rope climbing were among the first exercises to be included in the origins of modern gymnastics in the late 18th century and early 19th century. Wikimedia Commons has media related to Climbing.